Discover innovative office space planning, unique office workstation design, corporate office furniture solutions and teamwork oriented office layouts. OMNI Pacific recently embarked upon the office design and furniture production of Inova Diagnostics, a prominent bio-med diagnostics developer. The facility layout was set to transition from a private office setting to open stations that maximize space and promote collaborative work between different departments. Needless to say, this new design concept brought up conflicting opinions among company members with concerns that the new open layout would limit individual privacy and storage requirements. OMNI took on the challenge of proposing original solutions that are functional and suit the growing company’s needs. All space planning and design choices were discussed and revised to find the perfect fit for the company with a close partnership and on-site consultations at both Inova and OMNI facilities. Standard cubicle arrangements were reimagined into collaborative stations for teamwork between departments, utilizing innovative moveable wall systems for electrical and data distribution and translucent acrylic panel separations that allow visibility and natural light to carry through. 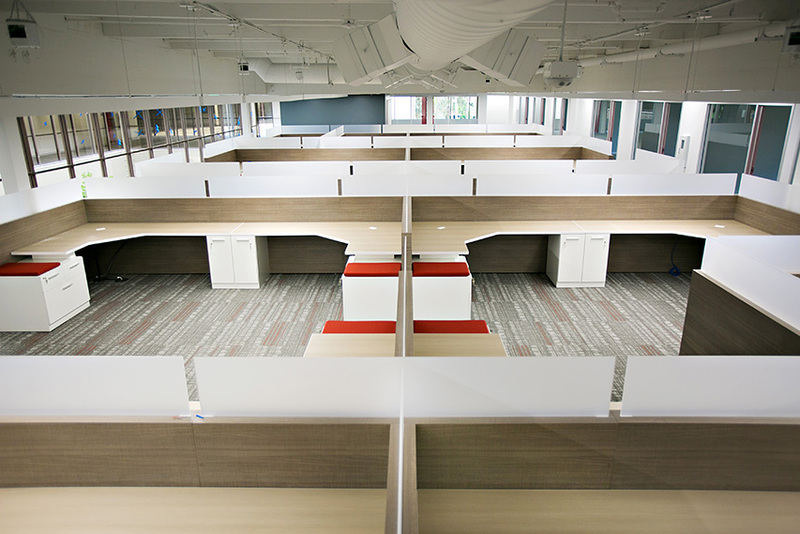 The original scope of work was focused on the new layout of these workstations, but seeing how efficient OMNI’s solutions were, Inova decided to extend its redesign to other areas of the facility. From reception and lounge areas, to break room and community tables, the project was completed with a cohesive transition between the spaces. 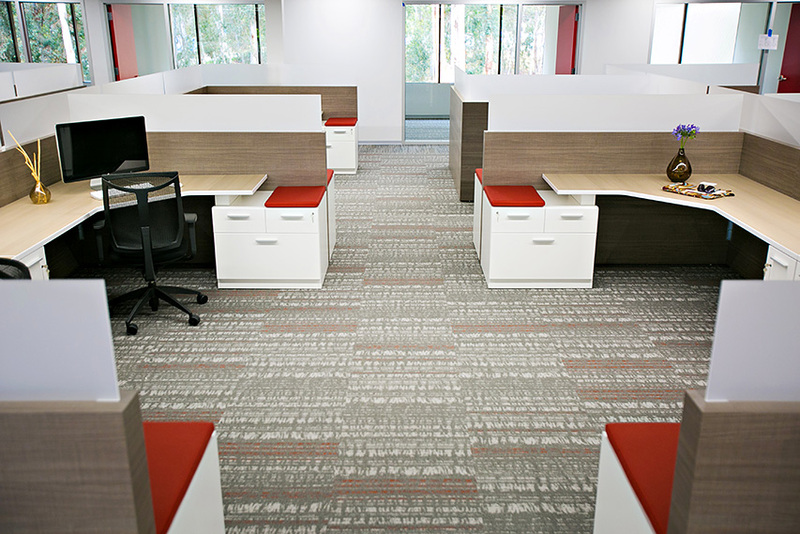 Modern and sleek designs were carried throughout with red accents that are true to company colors and enhance the brand identity. Textured laminate finishes offered a high-end look that resembles natural wood with the lower cost and durability of laminate. The end result far exceeded Inova’s expectations with OMNI translating the space into a design that tells a story and aligns with the value system of the company.